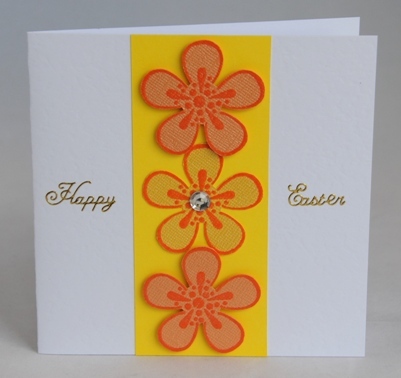 A panel of bright yellow card sits on the centre of this card.It is decorated with a yellow flower in the middle and two orange flowers sitting proud of the card above and below the yellow one. The gold greeting reads Happy Easter. The card is blank inside for you to write your own Easter greeting. If ordering by phone, please reference card #288.